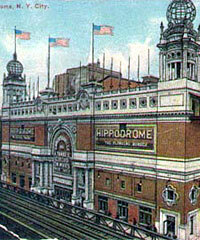 "The Hippodrome, New York. A Yankee Circus on Mars." 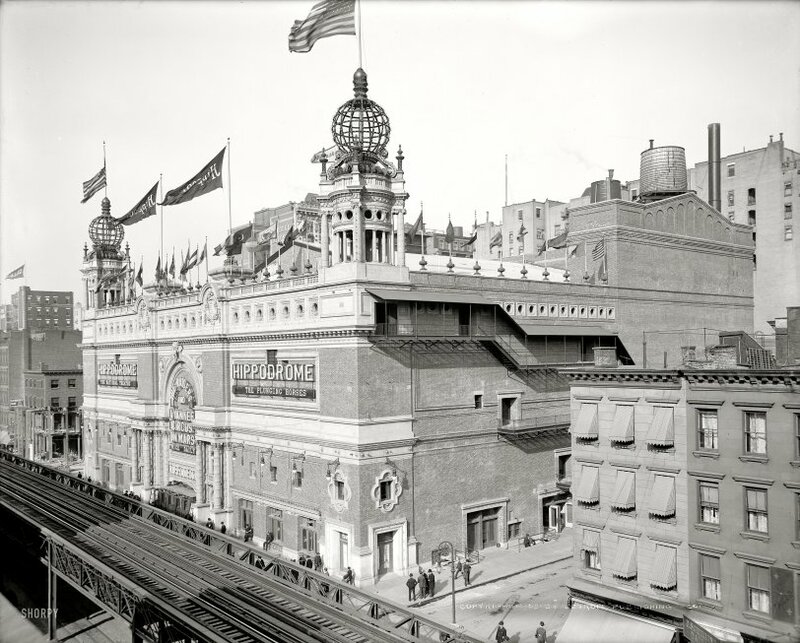 Which was the production that opened this 5,200-seat theater, the world's largest, in April 1905. 8x10 inch dry plate glass negative, Detroit Publishing Company. View full size. Submitted by Nathan on Sun, 05/08/2011 - 7:44pm. Did anyone notice the Algonquin Hotel in the background? Isn't it the oldest continuously operating hotel in the city? Submitted by Little Ms. Quest... on Sat, 05/15/2010 - 1:43am. I remember a multi-story parking lot at the NE corner of Sixth Avenue and 43rd Street called the Hippodrome. I always wondered about the name, but never in a million years would I have guessed there was a magnificent 5,200 seat theater on the site before that! Unbelievable! Thanks, Shorpy. Submitted by The Vexman on Sun, 05/09/2010 - 8:25am. 22-A British Blue Ensign, maybe Canada, India, or South Africa; can't make out the badge. At this point in time, the Canadian Red Ensign was not yet established. Submitted by Anonymous Tipster on Sat, 05/08/2010 - 8:20pm. Be sure to see the Hippodrome." Did you say the Hippodrome? Hey what did you stop for? And blew the place away! Submitted by Anonymous Tipster on Sat, 05/08/2010 - 2:14pm. By the famous plunging horses. Submitted by Michael L on Sat, 05/08/2010 - 12:32pm. There is quite an impressive array of national flags on the roof. Unfortunately, most are not furled out enough to seem them well, but besides the US flag, I think I can see ones that are unchanged since then: France (very left), possibly Japan and Mexico (adjacent to each other, middle section), and the Ottoman Empire (the crescent and star, very similar to the flag of modern Turkey). More interestingly, there are also flags no longer used: The rightmost flag on the front looks like the Kingdom of Italy (the modern tricolor plus an added shield in the middle). Two places to the left of that, with a lion holding a sword against a sun, is an old flag of Iran. The horizontal tricolor in the middle of the front may be either the Netherlands (red on white on blue) or the German Empire (black on white on red). I'd be interested if people figure out some of the others. Submitted by Bob Wilson Jr. on Sat, 05/08/2010 - 10:20am. I believe that it was located on the east side of Sixth Avenue between 43rd and 44th Street. Their "Plunging Horses" show must have been a precursor to the Steel Pier attraction in Atlantic City in later years. Submitted by GeezerNYC on Sat, 05/08/2010 - 6:19am. When I was just starting out as a stagehand in the late 60's, the oldtimers, in an effort to let us youngsters know how good we had it, would talk about "working at the Old Hipp for a Coke and a hotdog a day." Submitted by rgraham on Sat, 05/08/2010 - 12:49am. But it was a little before my time. It was between of foyty tuyd and foyty foyd street on sexth avenew. I think this postcard was glamorized from this photo. Submitted by Vincent on Sat, 05/08/2010 - 12:26am. "A Yankee Circus on Mars" was a 4 hr. production that included 280 chorus girls, 480 soldiers, a parade of cars driven by elephants, an equestrienne ballet, acrobats, & a cavalry charge through a lake. Submitted by Peter on Fri, 05/07/2010 - 10:57pm. Strange odors plagued the 42nd Street station of the Sixth Avenue subway for years. Engineers repeatedly checked for gas or sewer leaks, all to no avail. Finally, sometime in the 1950's, the cause was figured out - underground deposits of elephant dung from circuses held at the nearby Hippodrome, by then gone for over a decade. At least this is the story-- suffice to say that my patented Urban Legend Detector is flashing yellow.